Collaborators’ Q&A: Poet Julie Swarstad Johnson: Paired with the playful squares and the drifting bits of paper (or maybe they’re clouds—it changes every time I look! 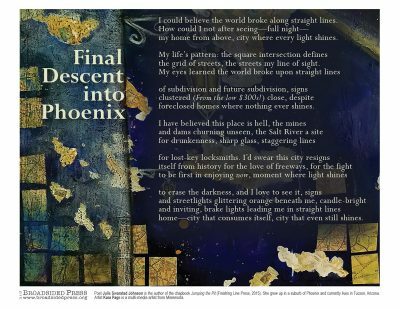 ), those gorgeous, intricate streetlights peeking out from behind the text gave me a new feeling for the poem. Artist Kara Page: I was inspired by the idea of looking at the world via a bird’s eye view, except I took it to the extreme hence seeing the globe rather than a city. I had the idea of seeing the lights on earth at night more so than the actual earth. Artist Kara Page is a multi-media artist living in Minnesota. Julie Swarstad Johnson is the author of the chapbook Jumping the Pit (Finishing Line Press, 2015). She lives in Tucson and works at the University of Arizona Poetry Center.